15 min drive from the airport. 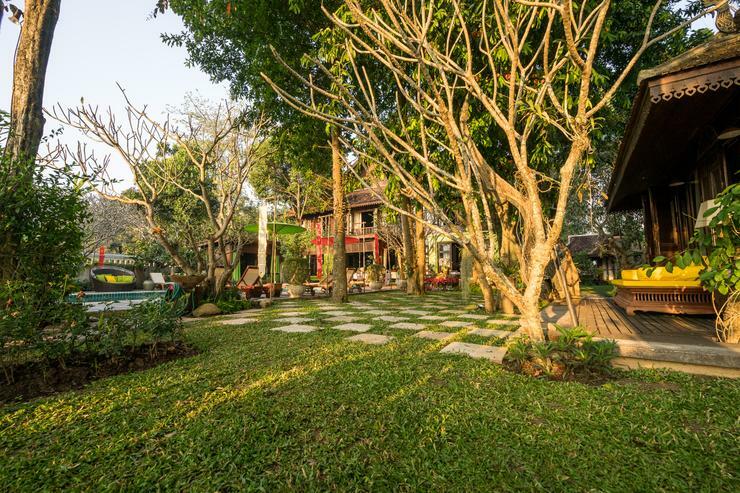 On the banks of the river Ping a short drive away from downtown Chiang Mai and its market. Close to the handicraft centers of Chiang Mai. Special holidays that fall within Low Season will have the High Season rate applied. Such as Easter. Short stays (3-4 days) will be considered, as will lower rates (especially for small parties and/or during off-season). 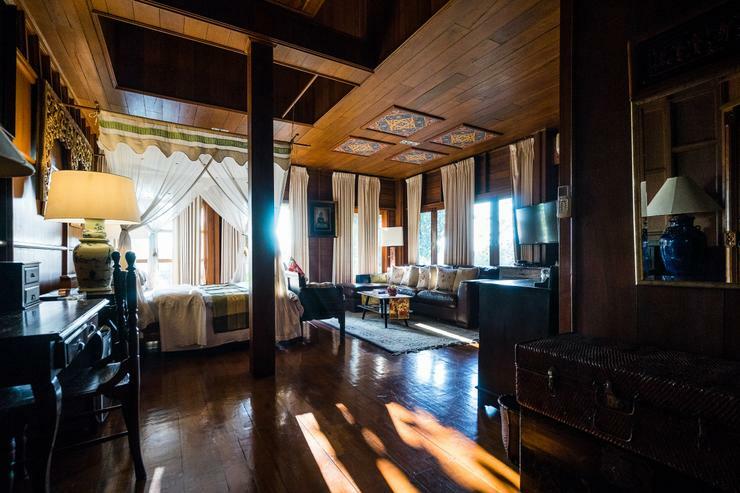 Discounts are possible on a case by case basis where only one or a few rooms are needed. This offer applies primarily in the low and off-seasons. Please do talk with us to discuss your individual requirements. A full time maid and cook are available to prepare your breakfast (full western breakfasts) and other meals. Mainly Thai food and a few simple western dishes such as pastas/salads etc. (Food costs are not included but are prepared at cost prices, be it from the local markets or supermarkets and therefore prices are very low.) The maid is also available for laundry services. Full time staff are available for daily maintenance. 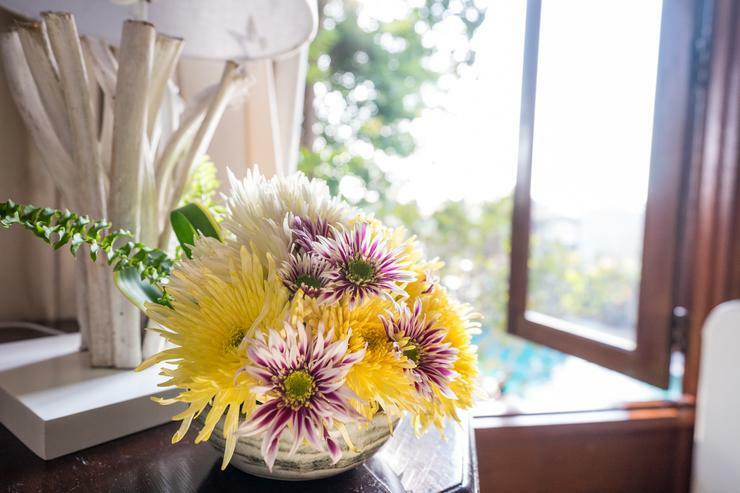 The Resident Manager is on duty for special requests and to ensure smooth operation of the villa. Baby sitting can be organized with advance notice and by arrangement with the villa manager. Sometimes if it is a small group and the catering staff is not too busy with their daily routine they may be able to help, but otherwise we need to get extra personnel. The villa has a well filled wine cooler with a selection of connoisseur French wines available at cost prices. 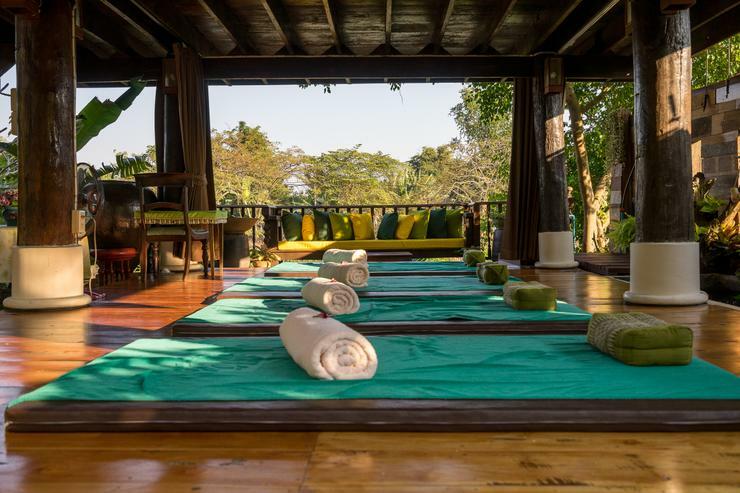 Along with a high quality BOSE quadraphonic sound system around the pool you will find a stereo system in the lounge and in the Master bedroom. The lounge is equipped with a 42in LG flat screen with home theatre sound along with multi channel cable TV for your viewing pleasure. The master bedroom is also equipped with TV (multiple cable channel system) and sound HI FI system. 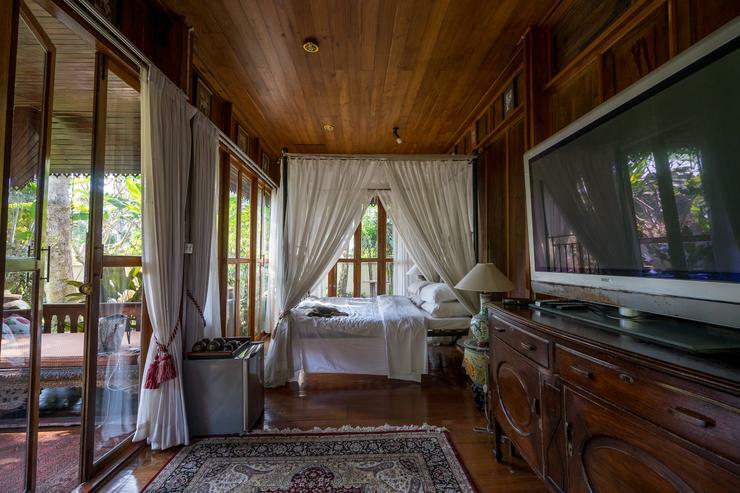 All other bedrooms are equipped with Sony Trinitron and a limited satellite TV system (as provided in the hotels). A BOSE quadrophonic sound system is available around the pool and in the lounge along with a five CD disk changer for creating the right atmosphere. 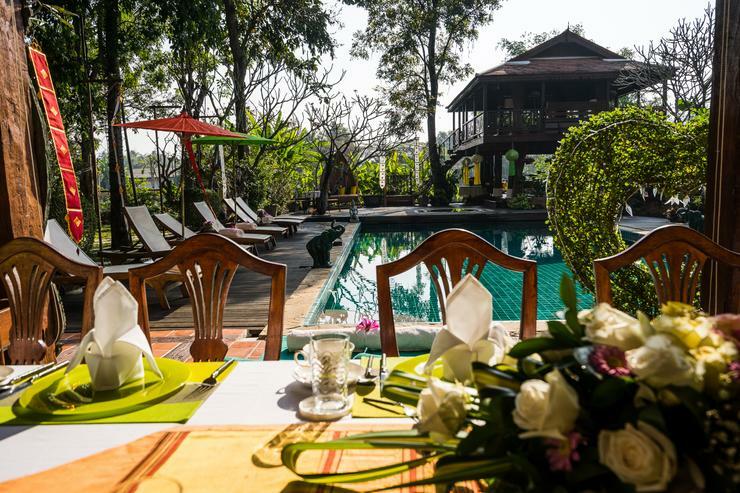 The villa is equipped with a decent desk top computer with flat screen and printer with internet access for free usage of guests. For those who wish to bring their wifi enabled laptops they may continue working around the pool or from any of the bedrooms and lounge as the villa is connected. Airport pick-up and drop-off can be arranged by us for you, and is charged at cost price. There are no extra charges added by us. Let us know your requirements once your booking is confirmed. No less than 30% deposit to confirm your booking(50% for Christmas/New Year period). The remainder to be deposited no later than 30 days prior to your arrival. All payments by direct bank transfer. 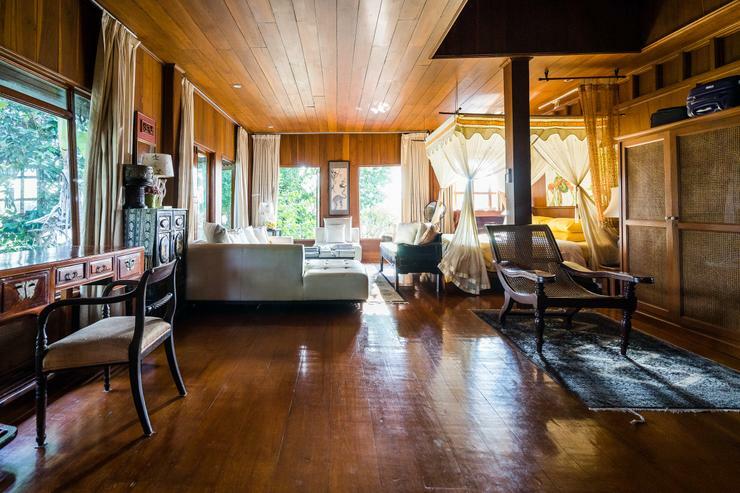 Looking for Chiangmai villa rentals set in tropical splendor beside a romantic river? 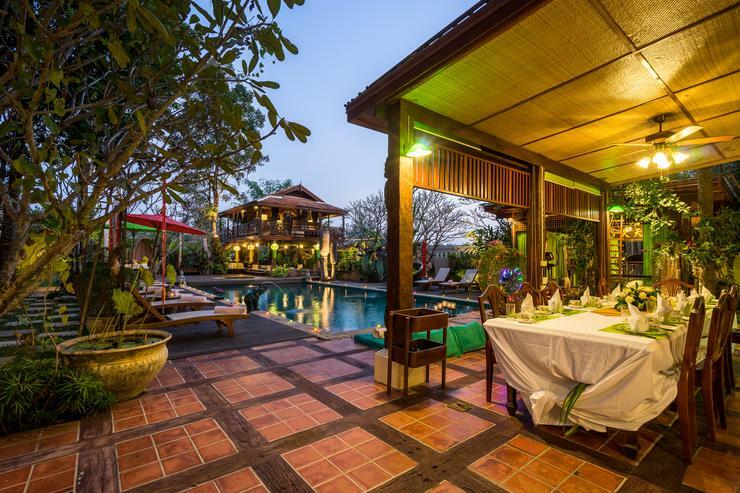 Baan Cheep Chang is one of the best luxury villas for rent in charming Chiang Mai. 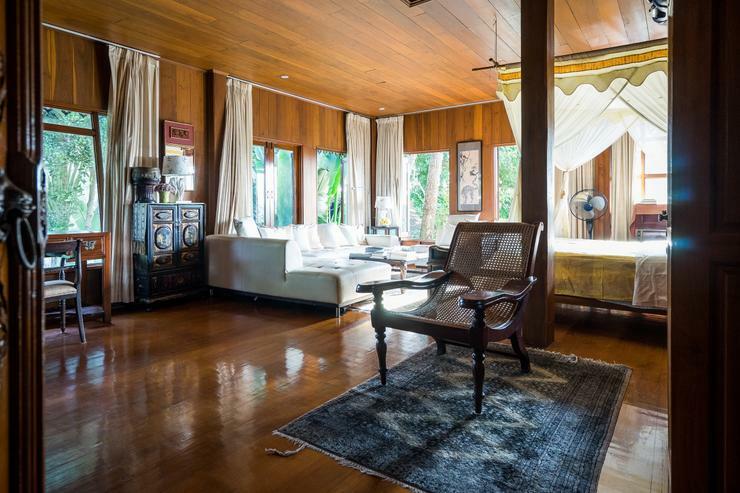 Come and live in a luxury villa in true Lanna Thai style right on the banks of the romantic river Ping. 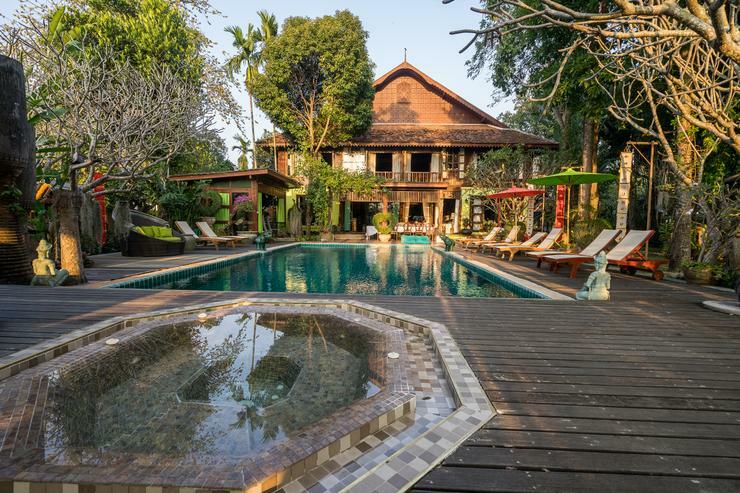 Just ten to fifteen minutes drive from the Chiangmai International Airport, and minutes to the famous Night Bazaar, entertainment, and restaurants. 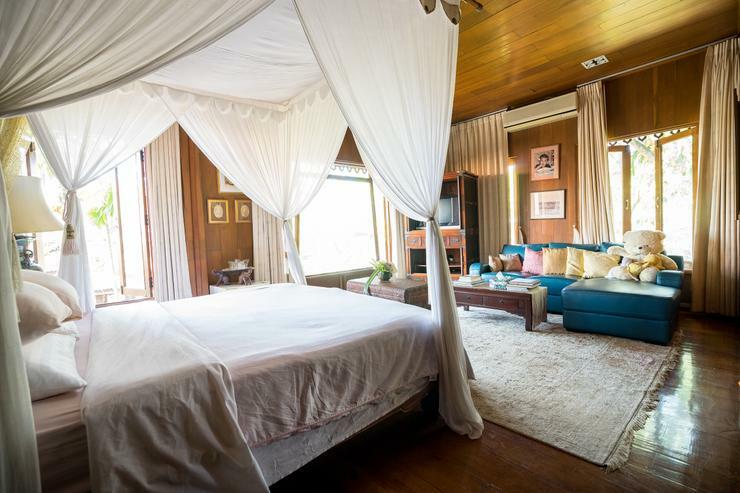 The villa has six main deluxe bedrooms all with en suite bathrooms. 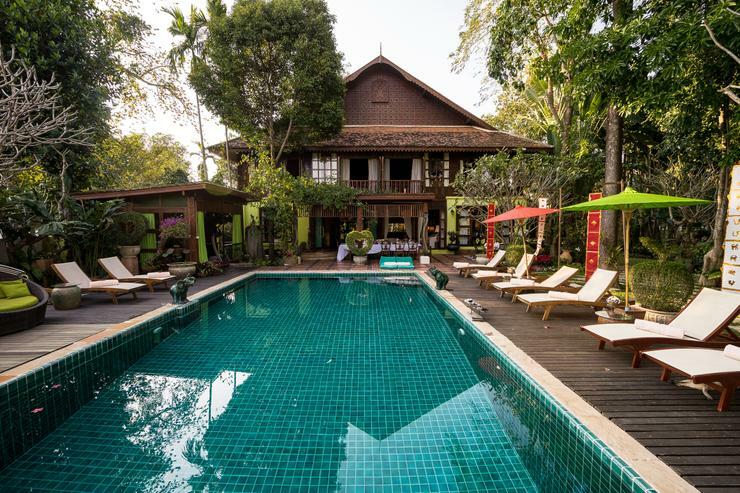 Baan Cheep Chang is located in lush tropical gardens which comprise three main buildings, man-made ponds and waterfalls and a magnificent green tiled salt chlorinated overflow pool. 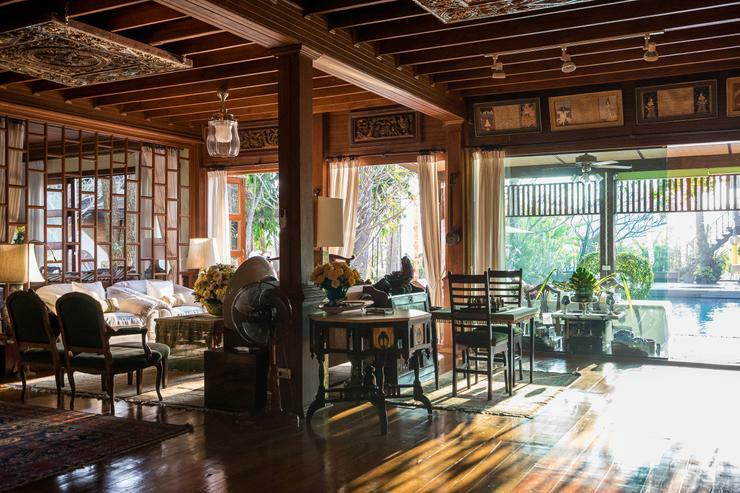 The main house has a large reception area with seated bar and two lounges both upstairs and downstairs, four very large bedrooms, two dining areas (indoor and out) a TV/DVD room and a large study with computer/internet access available to guests. The villa has recently been equipped with Free WIFI ADSL Internet Access. 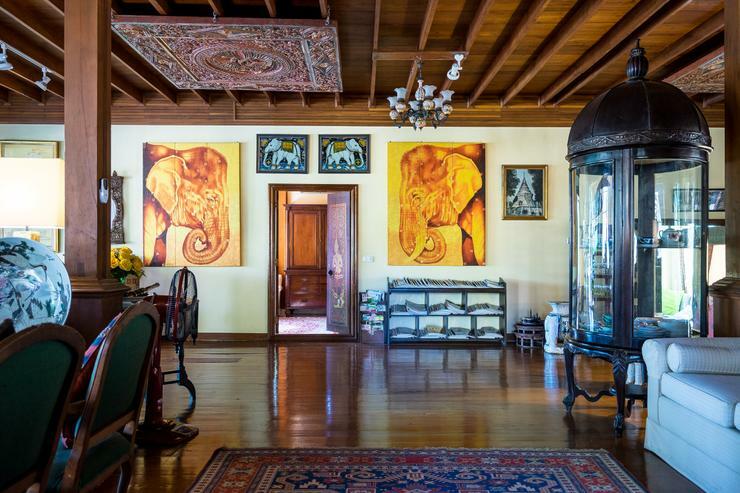 The main house has over 800sqm of interior space and is decorated to a very high standard with unique antiques from the region and a number of rare oriental rugs. 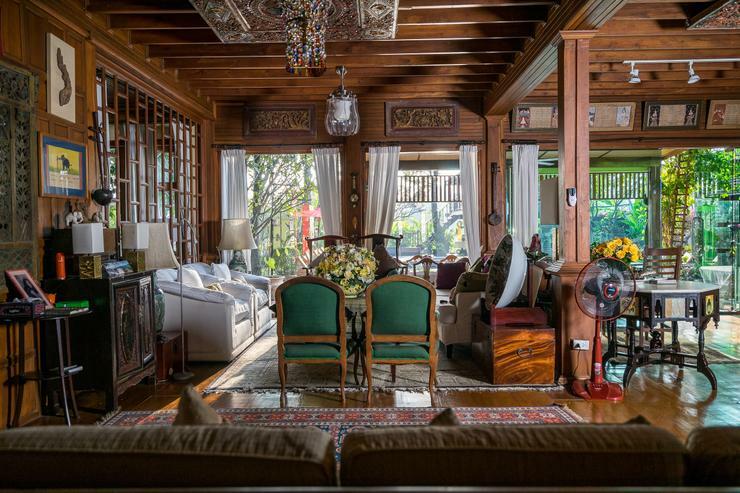 The house is essentially built of teak which the owner has acquired over many years. 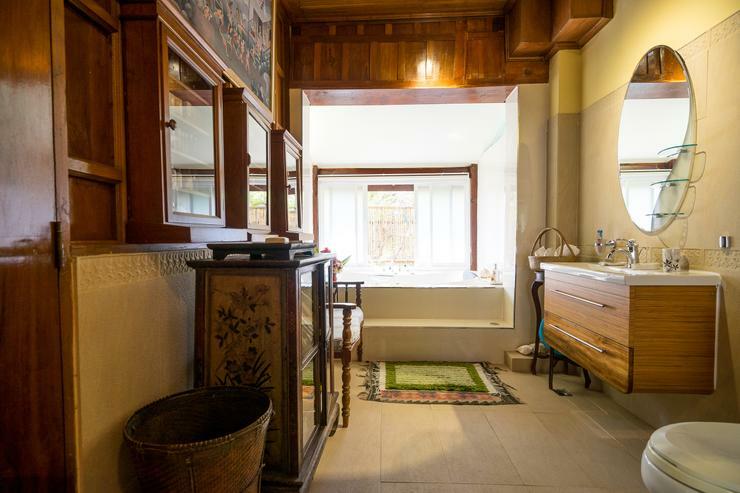 Nevertheless it is constructed with modern comforts in mind and all rooms have ample natural light which is often a problem in Northern Thai style properties. 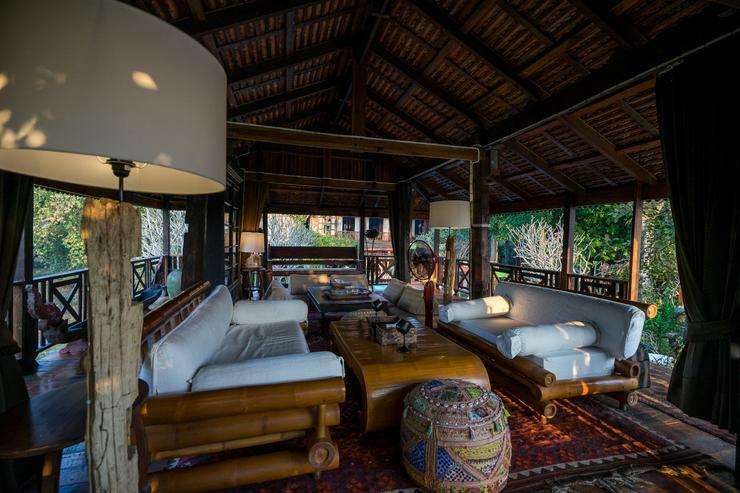 The villa stands in beautifully landscaped grounds of over two rai (over 3,200sqm) and comprises three main buildings. The villa itself which has four huge air conditioned bedrooms, two lounges, a large reception and seated hand painted bar area, a dining room which can seat 14 indoors comfortably, a TV/DVD room and a study with computer/fax access. 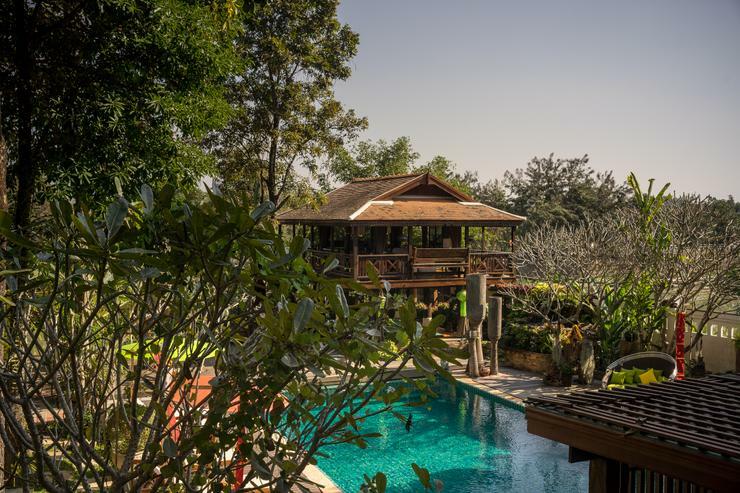 A fifth bedroom with en suite bathroom lies in it's own Thai style cottage right overlooking the banks of the river on the other side of the pool to the left of the sala. It also has a nice reading terrace. 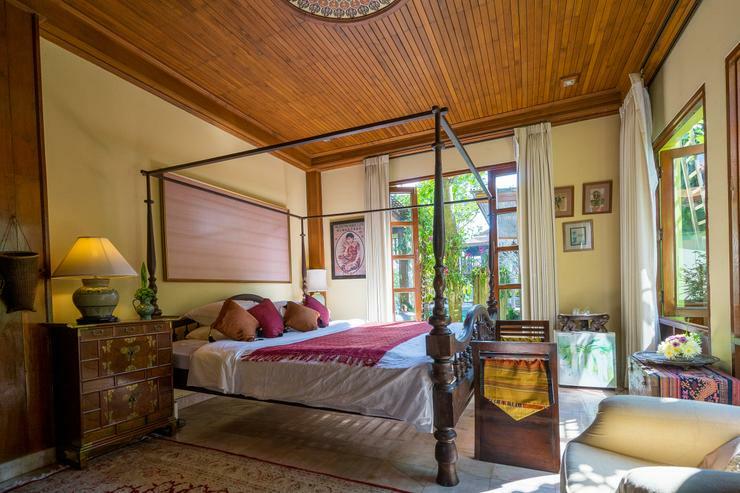 This room is perfect for honeymoon couples or older children wanting to be a little away from the rest. 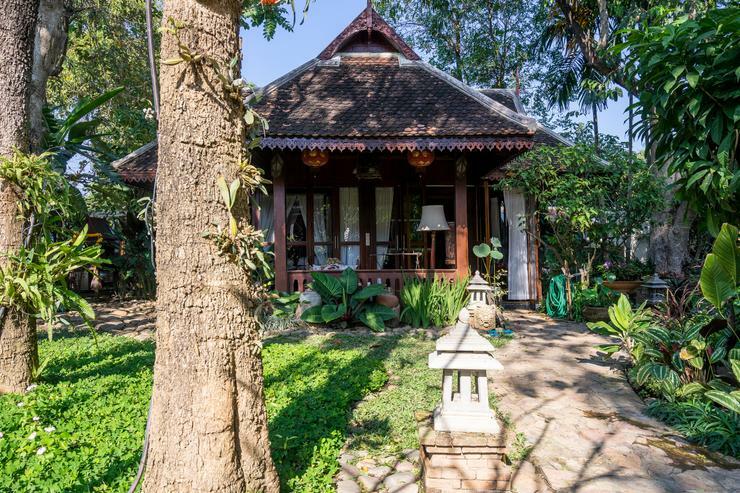 One other building is a central Thai style two bedroom house which can be used for children or as lodgings for nannies/maids (the rooms are non air conditioned but have fans) or passing guests. This building also houses the service kitchen. 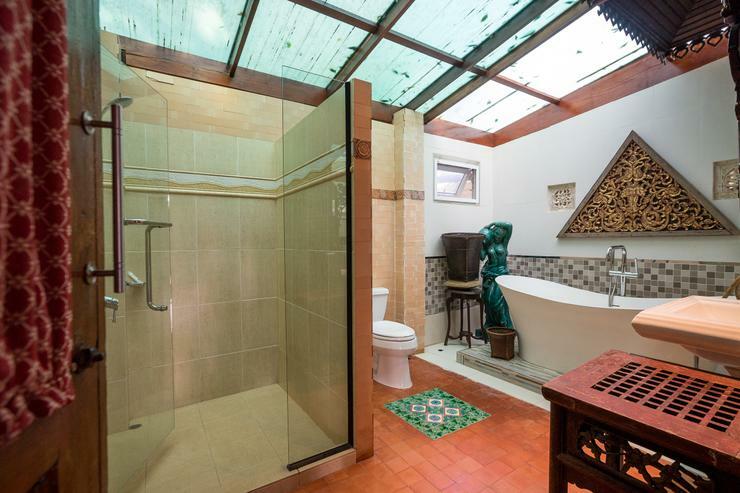 Another smaller building which also has two bedrooms houses the villa manager and staff. 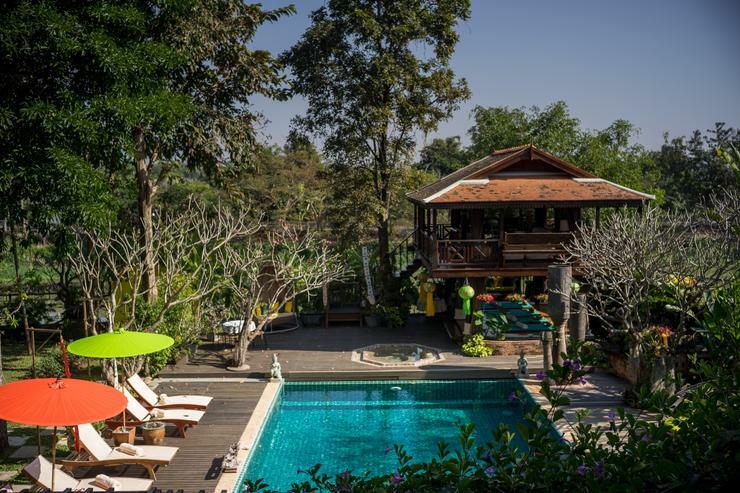 The property lies in a particularly green part of the outskirts of ChiangMai close enough to town to be able to go in for dinner and yet far enough to be truly in the countryside. 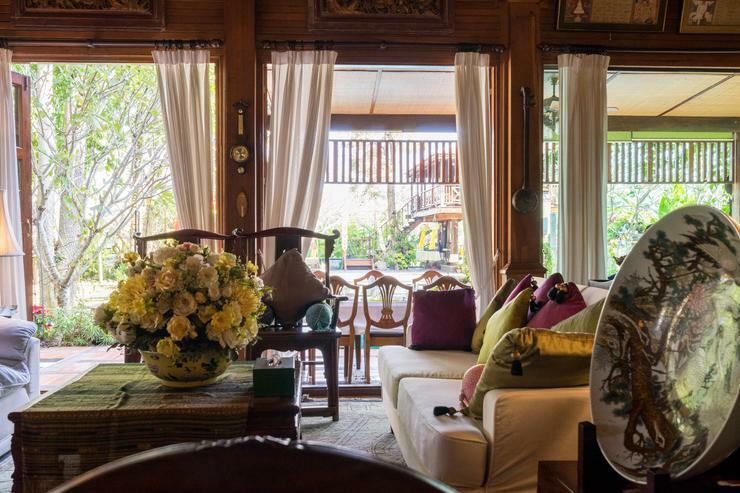 It is also very close to Hang Dong and Baan Tawai which is the handicraft/antiques/furniture center which is well worth visiting for shopping purposes. Some large shopping centers are also only a few kilometers away (Lotus, Robinson or Carrefour). 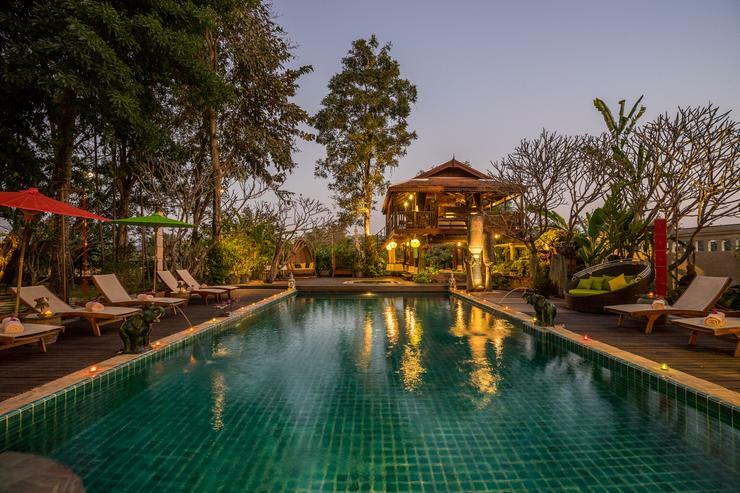 The villa has been tastefully decorated with no expense barred by the owners and is floodlit at night along with the pool. For dining requirements you can choose the main mahogany dining table which comfortably seats 14 or the outdoor table under the veranda by the pool which can seat up to 8. All rooms have views of the river and only the back room does not overlook the pool. There is a large balcony on the first floor which is an extension to the upper lounge and has sweeping views of the river and pool. This can be used for sunbathing or sipping cocktails in the evening. The gardens themselves have been nicely landscaped and comprise a walkway on the banks of the river which lead on the one side to a Thai style Sala which can be used for massages or drinks overlooking the river and at the other end a small pontoon which may be used for fishing or simply contemplating the passing waters! There are also two artificial ornamental waterfalls and a lotus pond which add to the romantic effect and are also floodlit at night. The outdoor terrace is covered and can seat eight. It overlooks the pool and the river. 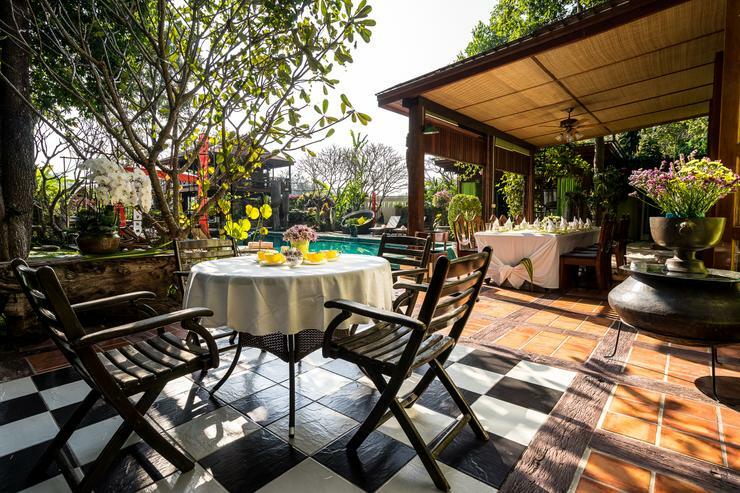 The pool area has sufficient shaded areas and sunny areas to satisfy all tastes. 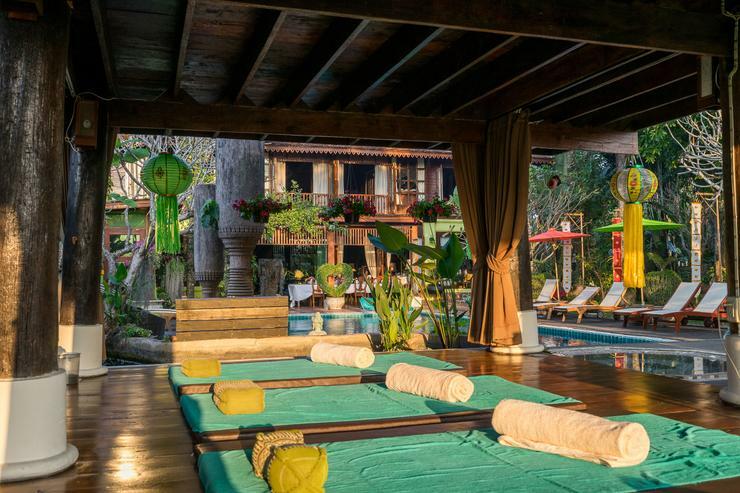 There are six deckchairs around the pool which is overlooked by some stunning four meter high hilltribe drums and some buddhas. 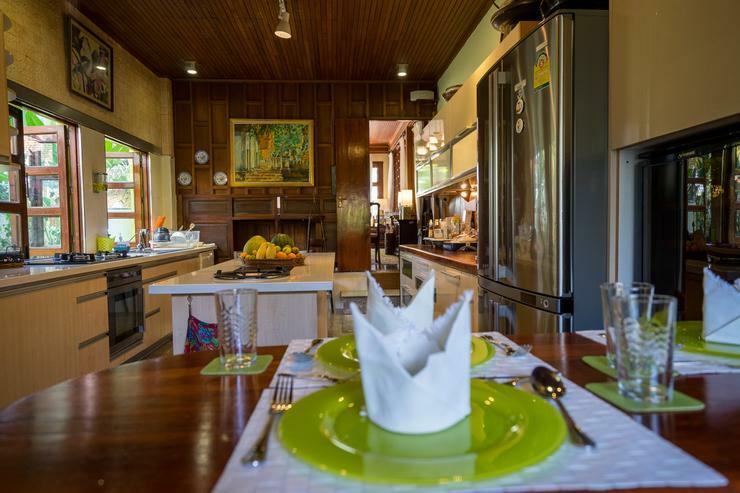 The indoor dining area is an antique mahogany dining table which seats 14 in comfort and is situated right next to the owners kitchen which is large and has all modern facilities such as microwaves, ovens, coffee making machines and toasters. All kinds of table ware and glasses are available and are of the highest quality. Barbecue facilities can also be arranged if required. The downstairs living area comprises a large reception with a seated hand painted bar area for pre dinner drinks. The lounge downstairs is very large and can comfortably seat twelve people. 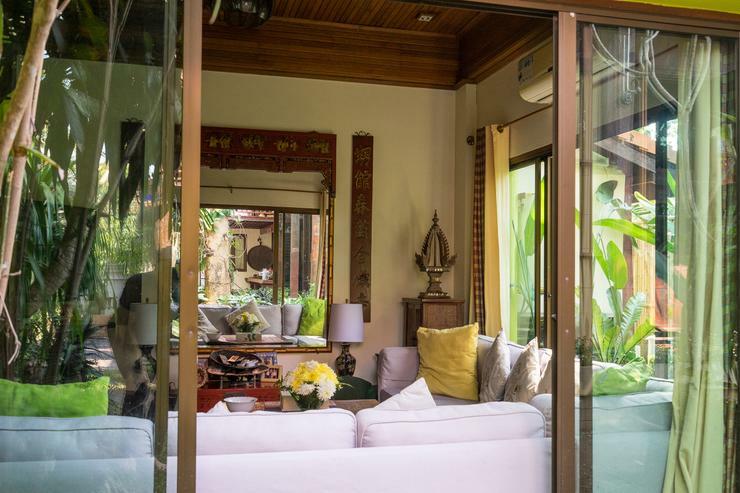 Close by is the air conditioned TV room with DVD player and cable TV with it's magnificent hand painted teak doors (cable TV gives access to most international channels with a wide range). 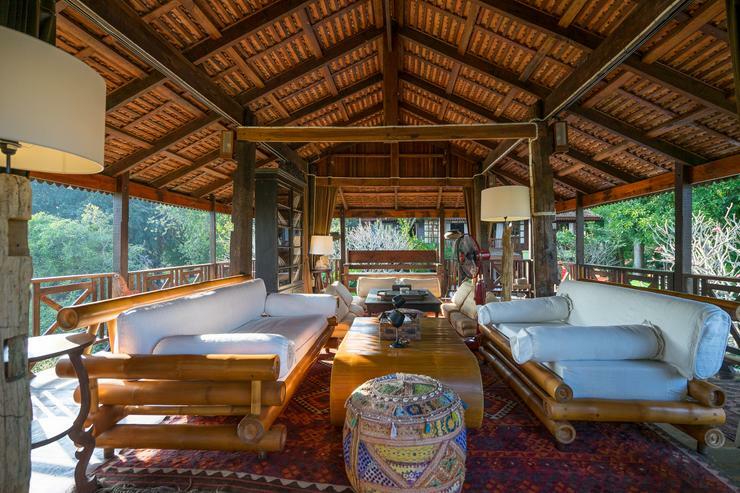 The upstairs lounge can come in handy when sharing the house with another family and it extends onto the first floor terrace overlooking the pool and river. 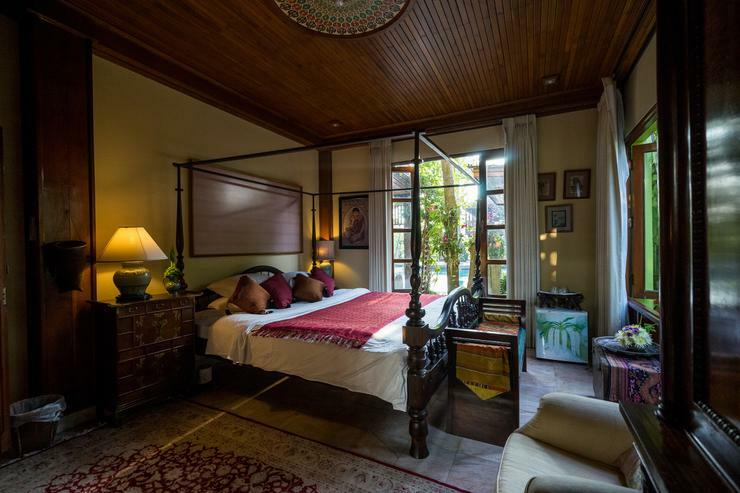 Three of the bedrooms are upstairs and are particularly large. 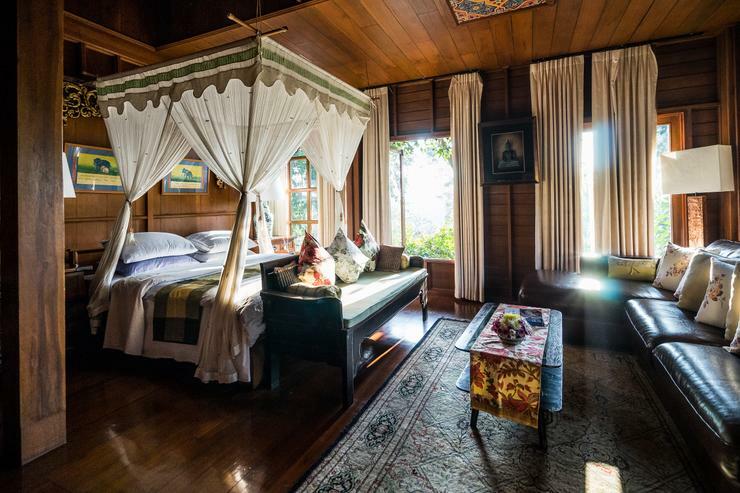 Some have hand painted ceilings but all have romantic mosquito nets and are all air conditioned. 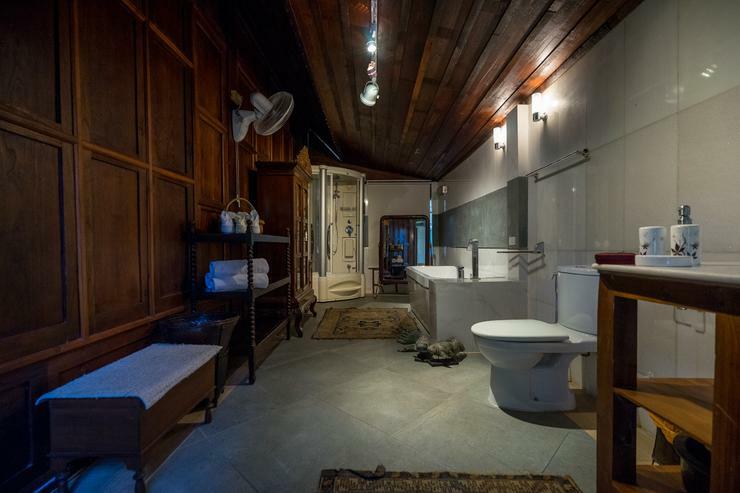 All have en suite bathrooms with bath /shower and toilet. 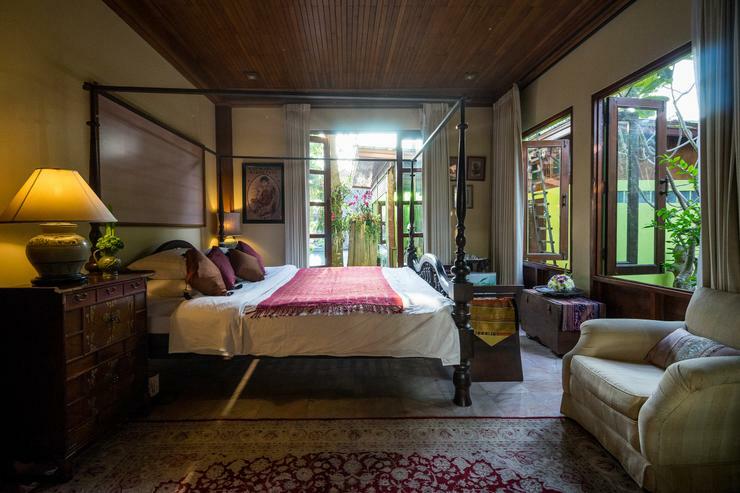 The downstairs bedroom is particularly romantic with a four poster bed (super king size) and hand painted ceiling and solid hand painted teak doors. 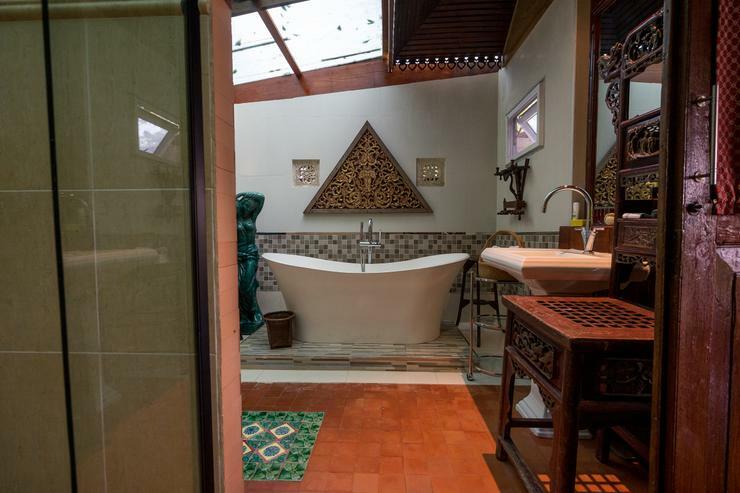 The bathroom opens out to lush bamboos. Only the master bedroom upstairs has a TV at this time and it is only for national channels. 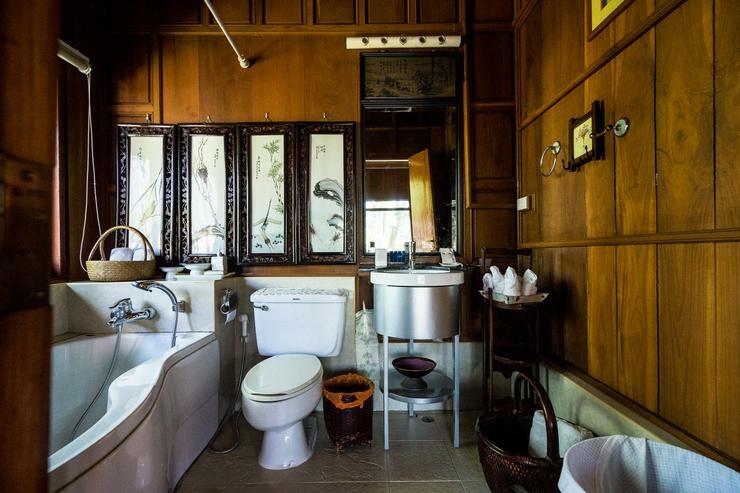 The upstairs rooms have wonderful green country views overlooking the river and pool whilst the downstairs room gives the impression of being in the jungle with a particularly spacious bathroom. The study room is not air conditioned but has a fan and is quite airy in the warm season. It is ideal for anyone wishing to do some serious work or write a book and has a very fast computer with Internet access, a printer and a fax machine which most businessmen will find more than adequate. 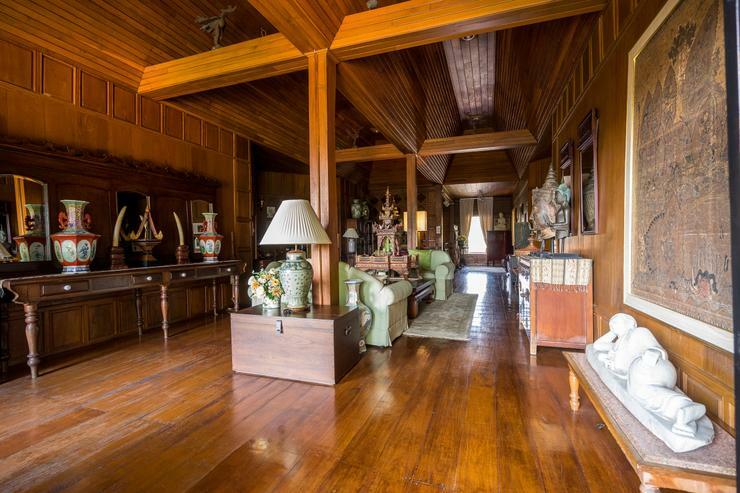 This is also the "Buddha" room which could give some extra luck to those wishing to continue running their business or finances away from home ! The room overlooks one of the waterfalls and is very relaxing. The service kitchen is housed in the annexe for staff or children near the car porch whilst the owners kitchen is right next to the dining area and has all the modern facilities for those wishing to do the cooking themselves. There is a nice selection of glassware and tableware for any home entertaining. 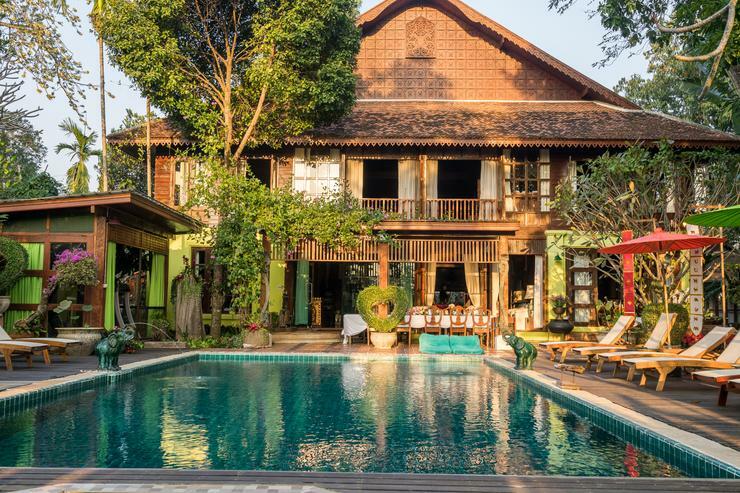 Located in Chiang Mai City, Chiang Mai. 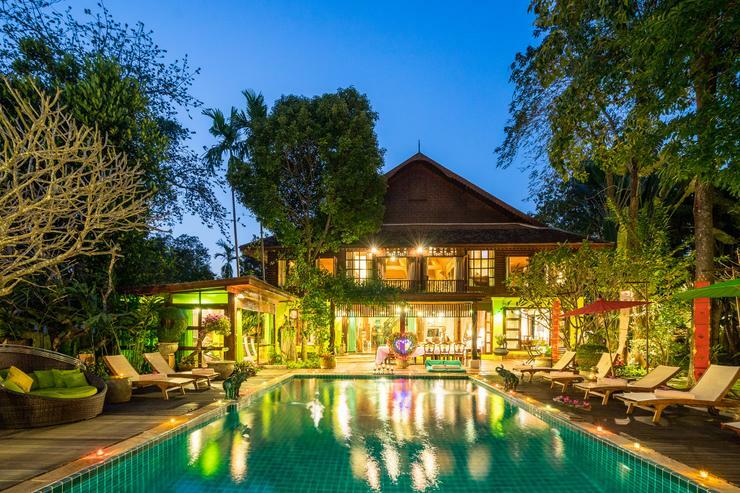 Lanna Karuehaad Villa is a in Thailand. 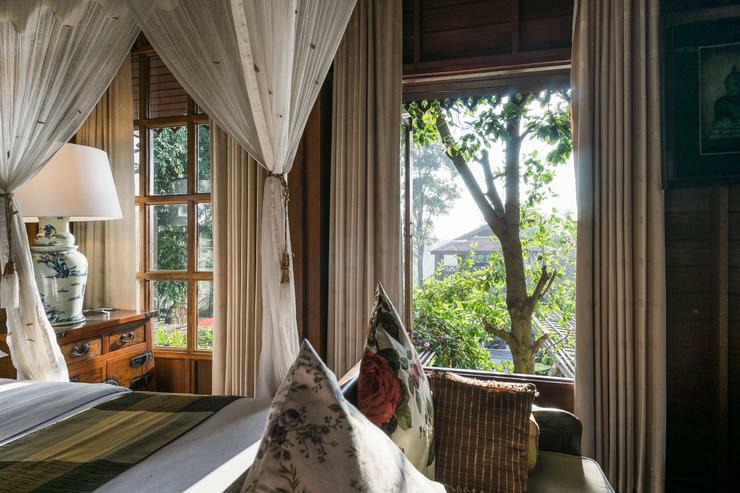 Located in Chiang Mai City, Chiang Mai. 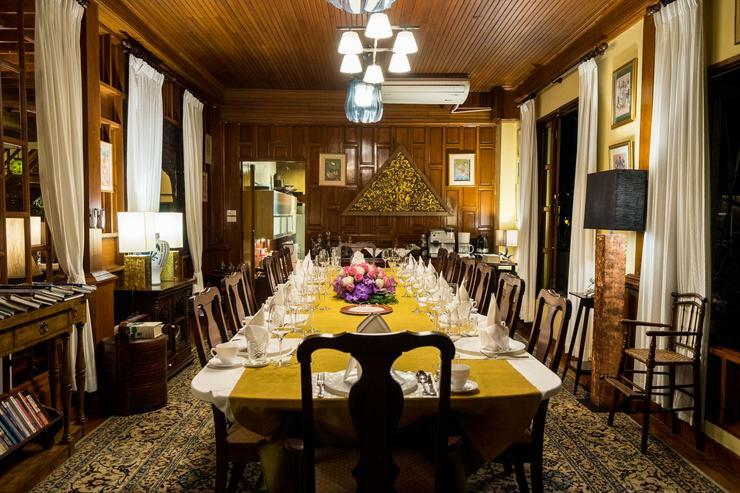 Lanna Karuehad Villa B is a in Thailand.